The capital tops a list of major cities at risk of becoming a bubble, according to UBS. The average home in Britain's capital city is now worth £499,997, according to Land Registry figures announced yesterday, a 9.6% rise since the same time last year. But there's a very real danger they could go into reverse soon. 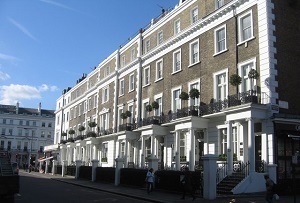 London tops a list of the most overvalued housing markets in the world in a report released by UBS today, which says the capital is in 'bubble risk' territory. The capital is one of the most expensive cities in the world (no kidding? ), it says, and it takes a skilled service sector worker an average of 14 years to save up to buy a 60m squared home. So what's to blame for this situation? Obviously homes in the city are generally in high demand because of the high concentration of well-paid jobs. But investors (some, but not all, from overseas) looking for a nice return rather than somewhere to actually live are also culpable. 'Foreign demand and demand deriving from safe-haven seekers largely explain current valuations,' the report said. 'Global geopolitical risk and the high property valuations in Asian cities have helped to propel London house prices to new heights.' Low interest rates and Help to Buy don't help either. London wasn't the only city to come under fire. The report said a correction in Hong Kong's housing market 'seems imminent', while homes in Sydney, Vancouver San Francisco and Amsterdam are also seriously overvalued. It seems impossible that this situation can continue for the long-term. The only question is whether the hot air flows gently out of the housing market like a slow puncture or tears it to pieces like a violent blow-out on the M1.